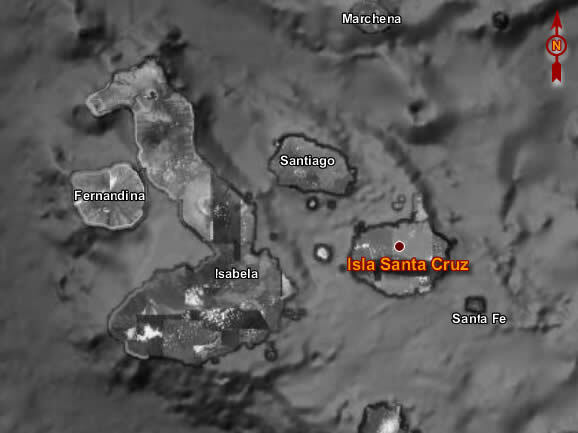 Santa Cruz Island is located in the middle of the Galapagos Archipelago, has an area of 986 km ² and a maximum altitude of 864 meters. It is also the most populated island and the second largest island after Isabela. This island is a huge dormant volcano. It is estimated that there were eruptions approximately a million and a half years. In Santa Cruz are the headquarters of the National Park of the Galapagos Islands, and the Charles Darwin Research Station. From the coast you can enjoy beautiful beaches and bays with turtles, seals and seabirds. Santa Cruz is composed of two materials of different geological ages. The oldest part is the narrow strip found in the northeast, an area formed by lava and limestone fossil, the youngest covers most of the island and consists of a series of eruptions of basaltic cinder cones overlapped by more youth. It was settled in late 1920 by a group of Norwegians, his dream of canning fish was not accomplished and some of them settled in the upper and changed their activity, from fishing to farming, to live. Here is the most populous city of the archipelago, Puerto Ayora, where more than 10,000 people. It is the tourist destination of the Galapagos because of its proximity to the island of Baltra and the small airport of this island make it an ideal place to enjoy an excellent vacation in Ecuador. In Santa Cruz Island can travel through seven different vegetation zones and territories of giant tortoises, reached the summit of Cerro Croker to 2834 feet altitude, and enjoy a great view of the island. There are several tourist attractions around the city, like Turtle Bay, a fascinating white sand beach approximately one mile long. You can also visit "Lonely George", the only survivor of his special turtle. The lava tunnels and craters show the origin of the islands. I also visit a wide bay of turquoise, the Bay Academy, which is flanked by a cliff on the western side, where several houses were observed on the rocks. Santa Cruz, with its lush vegetation, beautiful landscape and diverse climate, has unique flora and fauna: giant turtles in the region of Chato and the Hut, giant cacti and a variety of lush trees and edible fruit. It also has a tourism infrastructure such as hotels or restaurants to meet the needs of domestic and foreign tourists. Santa Cruz beaches are famous for their crystal clear waters ideal for scuba snorkel and surf. Founded in 1959, under the auspices of UNESCO and the World Conservation Union. Here you can observe turtles of the different islands of the archipelago. Interesting fissures formed by lava that form two giant walls pierced by an arm of filtered salt water from the top where it mixes with seawater. The giant cactus are a feature of the landscape. Subsidence craters are formed by a series of eruptions when the islands were still active. The craters Twins are the only place on the island where the forest Escalecia and some species of finches. It is one of the most beautiful beaches of the Galapagos, white sand, formed from the remains of bones of fish and coral. Here you can observe the marine iguanas, sharks and sea turtles.